My last post was mid-flu. While writing, I thought I was getting better, but then the next few days were spent with me barely able to get myself off the sofa for more than half an hour. Exhausting and extremely frustrating, not being able to do anything. It’s now 3 weeks later and finally, I’m almost feeling my old self again! Yippee! Bursting full of ideas for my sewing adventures for this year. Please come along with me, give me feedback, hints, tips, advice, etc. I’d love to hear from you and see what you’re doing. So, have sketched out a few ideas in my sketchbook: things I’m planning to make this year. 1. Skater dress. Free pattern with one of my sewing magazines a month or so ago. 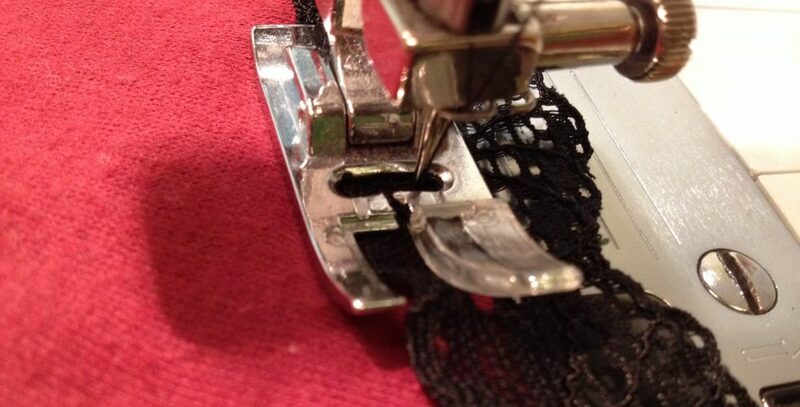 It’s a Simple Sew pattern. I love indie patterns (if you do, see Sew magazine this month, with a cool article on indies). I have a length of pinstripe wool that I think would look great for work. Watch this space, as I think this is my next project! 2. Pyjamas. Have made pjs for myself before, a couple of times, and some sweet ones for my little boy in a pirate fabric. But want to make Margot pjs from Tilly’s book Love at First Stitch (have I told you before how much I love her stuff?! I must have done! She is totes my hero in sewing right now, and the reason I got into sewing clothes rather than bags all the time!) Although I still lurve making bags! 3. Another Ruby dress. I made the first one in a lovely navy floral fabric that I had in my stash (looks a little bit Joules). I have worn it a lot and it’s a cute little dress. I fancy another – maybe a red one? 4. Francoise dress (another Tilly pattern). I bought the pattern a while ago but as yet haven’t found the right fabric. Looks lovely though – fancy the sleeved version. 5. Oven gloves. How glamorous! I need some, and want some more funky than the Tilda/Cath Kidston-style ones that are everywhere! 6. Kids’ clothes – in particular, girls’ dresses & skirts. I don’t have a girl myself, but really hate the sea of pink, flouncy, sparkly offerings that clothes manufacturers think girls want. I fancy superheroes, dinosaurs, space, etc. There’s been stuff happening on twitter about this very thing this month – M&S are stocking Natural History Museum dinosaur clothes…”for boys”. 7. Skirt(s)…my fabric stash calls! 8. Another Coco dress as I love mine and it’s so easy to wear. Polka dot this time? Stripey? Dinosaurs? Hmmmmmm…. 9. Stag head on tweed cushion. Maybe one for next winter. I’m also planning to blog more often – aiming for twice a week if I can. Look forward to seeing you! Love these totes – you can never have enough! 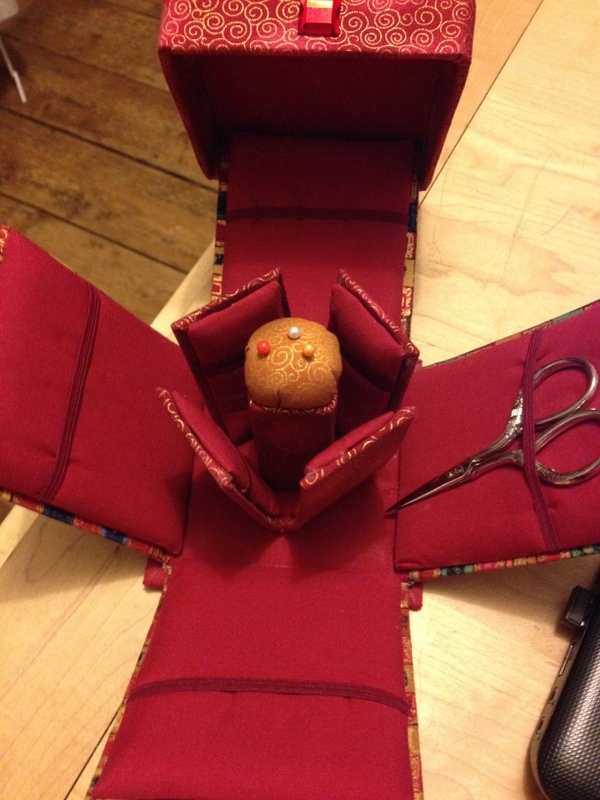 Here I’ve contrasted different fabrics and added my fave – the button! 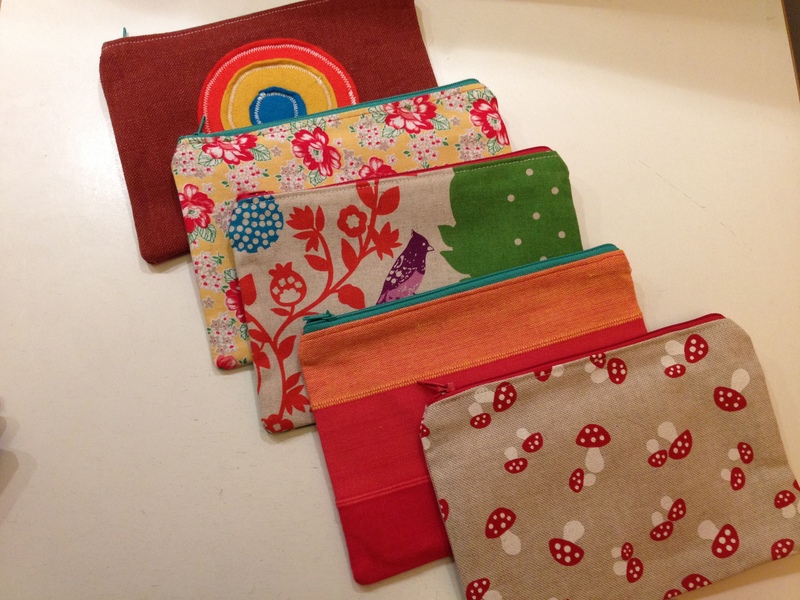 Also awaiting some exciting news about selling my bags & bits, so will let you know when it happens! Happy New Year to you, my lovely reader, from me in beautiful Norwich! As I write this, I am slightly delayed in welcoming in the New Year in all its glory. I had planned to get Christmas out of the way, and then feel raring to go with tons of ideas for new makes, sorting out my sewing space and developing my little business, but then the dreaded lurgy struck. We’ve all been unwell over the last few days and despite rallying round for a few hours for a lovely little party with good friends on New Year’s Eve, have all felt pretty rubbish and devoid of energy and enthusiasm. But this evening things are looking a little brighter and I’m beginning to get my mind in focus ready for lots of fun things to do and make in this, 2015. I have plans! I have also signed up for the Create & Thrive 30 Questions Challenge, to help me focus on what I want to do with my sewing as a business. You can sign up here for what looks to be a fun and thought-provoking month of questions for yourself! I got some lovely sewing presents for Christmas and my birthday (which is unfortunately Boxing Day – that’s the 26th December to you folks not in Britain!) – a pom pom maker, the Merchant & Mills sewing book, some awesome fabric my mother in law brought back from California for me and a lovely turquoise IKEA wheeled trolley for storing all my crap sewing essentials. 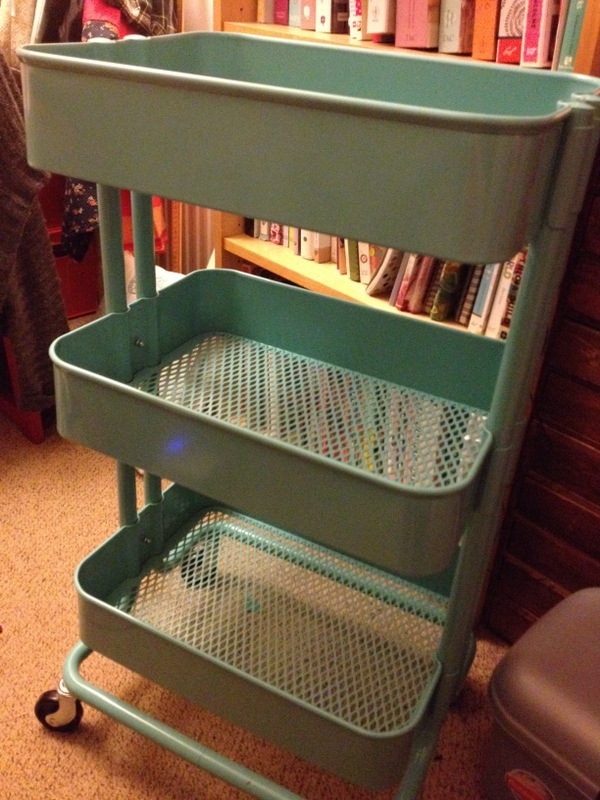 IKEA trolley – all ready for storing my stuff! 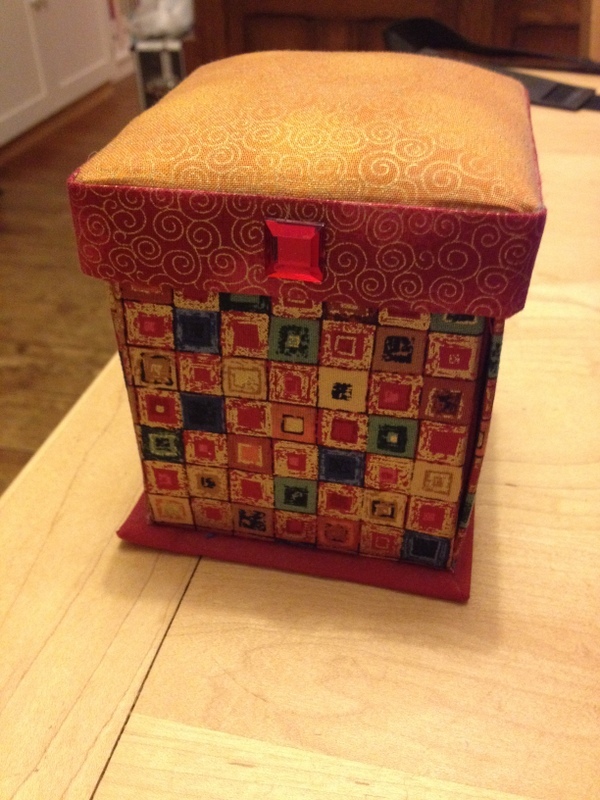 A friend also gave me this cute magic box that opens up into a very cool little sewing cube – it’s very pretty and really useful. I feel very spoiled! What crafty goodies did you get for Christmas? And what’s on your To Do list for this year?